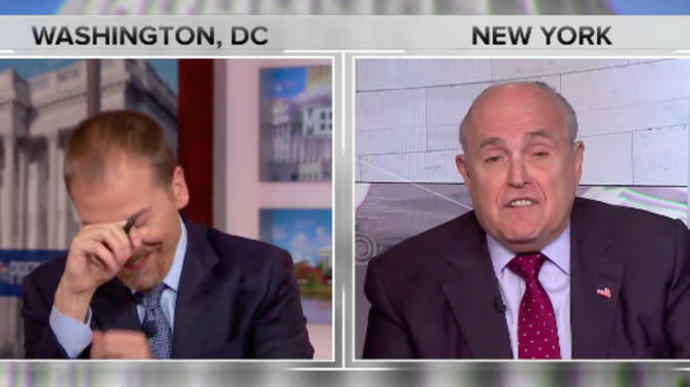 Rudy Giuliani on Sunday gave another eyebrow-raising TV interview, telling NBC's Chuck Todd on Sunday he's concerned about special counsel Robert Mueller interviewing President Donald Trump because the "truth isn't the truth." The president's attorney, appearing on "Meet The Press," continued to attack the credibility of Mueller's investigation into Russian interference in the 2016 election and whether Trump obstructed justice. "Look, I'm not going to be rushed into having [Trump] testify so that he gets trapped into perjury," Giuliani told Todd. "When you tell me that... he should testify because he's going to tell the truth and he shouldn't worry. Well, that's so silly, because it's somebody's version of the truth ― not the truth." Todd, visibly perplexed, interrupted: "Truth is truth." But Giuliani frantically fired back, prompting laughter from Todd. ″No it isn't! Truth isn't truth!" Giuliani responded. "The president of the United States says, 'I didn't ―'"
"Mr. Mayor, do you realize... this is going to become a bad meme," Todd interrupted. Though Trump has expressed interest in having Mueller's team interview him, Giuliani has pushed back against the idea, warning his client that he could be caught in a "perjury trap." For instance, he has repeatedly claimed Mueller could accuse Trump of lying under oath if he denies having had a discussion in February 2017 with then-FBI Director James Comey about former national security adviser Michael Flynn. "Trump says, 'I didn't tell him.' And the other guy says that he did say it," Giuliani said Sunday. "Which is the truth?" Giuliani on Sunday also doubled down on Trump's stunning admission earlier this month that the infamous meeting in June 2016 at New York's Trump Tower that included the president's eldest son and a Russian with links to the Kremlin was to get dirt on Democratic presidential candidate Hillary Clinton. "The meeting was originally for the purpose of getting information about Clinton," Giuliani told NBC. "That was the original intention of the meeting. It turned out to be a meeting about another subject and it was not pursued at all." The Trump camp initially claimed the meeting among Donald Trump Jr, a Kremlin-linked lawyer and others was to discuss the adoption of Russian children by Americans.